The Thomas Wynn Sr. Memorial Award for Lifetime Achievement is presented in memory of Thomas Wynn Sr., an advocate for homeless veterans, a partner to NCHV, and a friend to many of our members and partners since NCHV's founding in 1990. The award is presented to an individual whose lifetime exemplifies the service and spirit of Thomas Wynn. NCHV co-founders Ralph Cooper, Bill Elmore, and Robert Van Keuren presented the 2015 Thomas Wynn Sr. Memorial Award for Lifetime Achievement to their fellow NCHV co-founder, and Executive Director of Swords to Plowshares Michael Blecker. Blecker has served at Swords to Plowshares since 1976, and as Executive Director since 1982. Since that time, Swords has grown from a small organization to one of the largest and most widely recognized veteran assistance organizations in the nation. 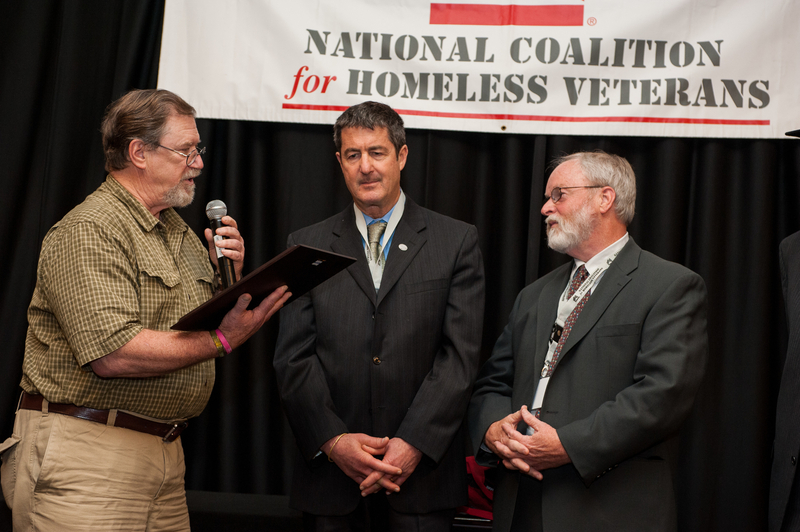 In addition to being an NCHV founder and Executive Director of a leading veteran service organization, Blecker is a co-founder and Vice President of the California Association of Veterans Service Agencies, and has served on various committees including the VA Advisory Committee on Homeless Veterans. NCHV is honored to recognize and celebrate Blecker's lifetime of dedicated and passionate service to our nation's veterans by presenting him with this award.